The film was amazing, James Franco performed it very well! A movie that has never been done is worth watching! On my boxing software, I always find such premieres. Brilliant! 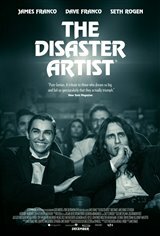 James Franco's portrayal of Tommy Wiseau was Oscar worthy. A must see for anyone who liked The Room. (It has us wanting to revisit that old Room DVD asap.) The entire cast was perfectly hysterical. Original story, well told, wekl acted. You cringe and smile continually. Fantastic flick! I was thoroughly entertained from start to finish .A very funny movie ,the whole theater clapped at the end . This was a great movie, thought provoking and interesting how the original movie was made. James Franco was great portraying the original person, Tommy with a little bit of heart. A dream that can come true!!! To this day it remains a mystery how Tommy Wiseau actually got the funding for the movie. The budget of THE ROOM was not $6000; it was $6000000.